Some User Scripts have been extremely popular and were made into browser extensions. An example of one would be the Reddit Enhancement Suite found at http://redditenhancementsuite.com/. You too could use your user script as a base of a browser extension! User scripts are run from browser extensions themselves. Grease Monkey (FireFox) was the pioneer add on to allow people to customize their browsing experience. Install the appropriate plug in for your browser. For this tutorial I will be using Chrome with Tamper Monkey. There shouldn’t be any significant differences with the process after installing either Grease Monkey or Tamper Monkey. 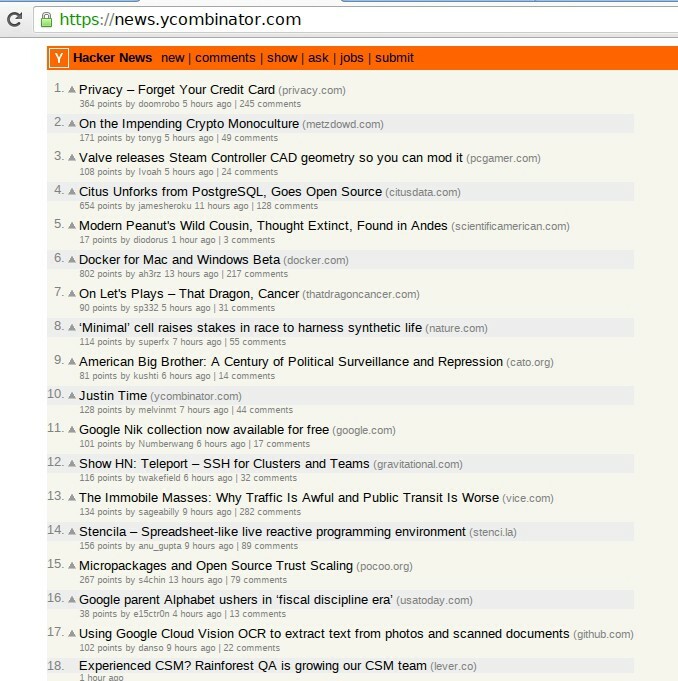 We are going to be making a slight change to the home page on Hacker News http://news.ycombinator.com. We will be using jQuery to make alternating links background colors slightly different to improve readability. Click on the Tamper Monkey icon in the top right and select ‘Add a new script’ from the dialog box. I will show you what mine looks like as well. Think of this as importing/requiring jQuery for a JS project. Let’s see if it our script loads on http://news.ycombinator.com and jQuery is good to go. You may be brought to the following page. If not, click on the Installed userscripts tab. Awesome! Out script is loaded into Tamper Monkey. The green dot on the left means that the script is turned on. 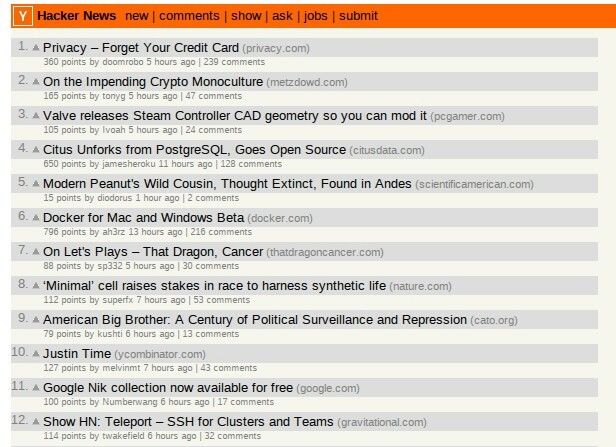 You can even see the Hacker News logo in the screenshot. It’s time to find the post elements we want to modify. Enter ***Ctrl + Shift + i ***to bring up the browser debugger. Now we want to select an element to take a closer look. Clicking on the blue square with the mouse in it at the top left of the debugger will open the element selector. You can also use the key command Ctrl + Shift + c.
Bingo. It looks like we found the element we want. 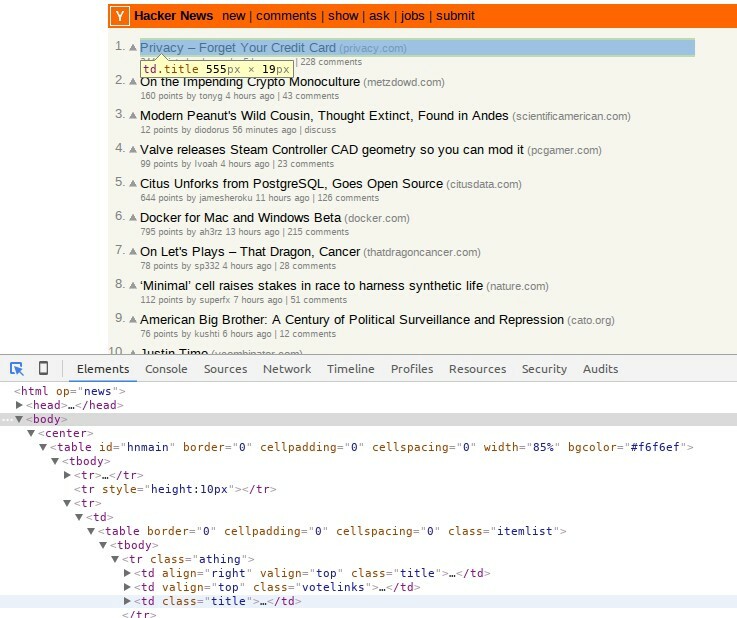 Hacker News has a clean HTML layout so it wasn’t too difficult to find our target element. let’s look at the resulting page. Remember to save your userscript then refresh the HackerNews page. You may have to close your debugger to view the whole page. Oh no?! What do we do… I don’t want to write any loops! Have no fear, fellow Campers. jQuery has come to the rescue yet again. jQuery provides special selectors just for an occasion like this. all we have to do is add :odd to the end of our selector so that the line looks like this. note: I have also changed the color to #EEE; to blend in better. There you have it. Now you have another creative outlet to unleash your budding coding wizardry on! User Scripts can be used to tweak the functionality or look of a site, to add a feature you’ve always wanted, plus much more. Write your own User Script to add something to a website you use often. Whether it be styling or a button that can toggle the visibility of certain elements, it’s all up to you. Provide your product in the comments here! Go forth and conquer Campers!